Gond ladoo is a popular dish found in Rajasthan.Gond is edible gum, extracted from the bark of a tree. Pale brownish yellow colored crystal of gond are easily available in the shop. Gond(katira) can be used to keep the body cool in summer and hot during winter. When soaked in water is used to keep the body cool. 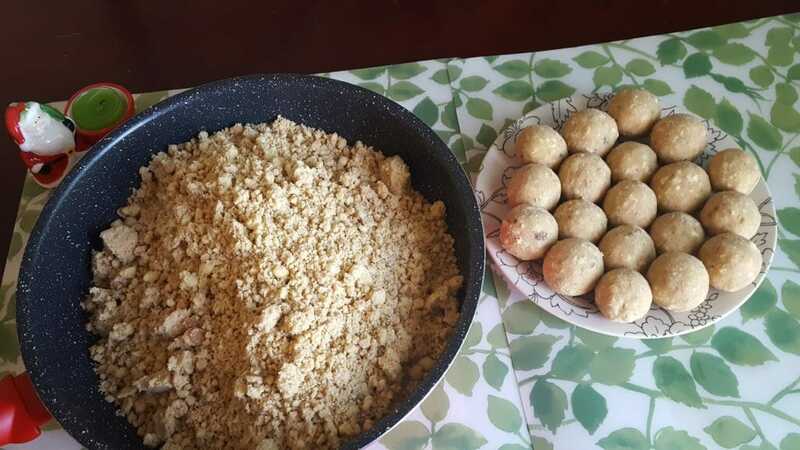 In winter it is generally fried and added to sweets, that generate heat so gond ke ladoo give heat during merciless winter time.It improves blood circulation and purifies the blood. Heat the ghee in a deep non-stick kadhai and deep fry the gond till the pieces puff up fully, then drain on absorbent paper and fine crushed and keep it aside. Heat 4-5tbsp of the ghee in the same non-stick kadhai add cardamom powder, white peppercorn powder saute it for one second, add the whole wheat flour and roasted it over a medium flame for8 -10 minutes, stirring continuously.Keep it aside. Take a big deep bowl add roasted wheat flour, sugar, gond, all dry fruits, raisins into 2-3 tsp. ghee and mix very well. Start making ladoos bind with palms. Serve it, and store in airtight container.